I know it’s weird to be sentimental about a knitting pattern, but I can’t help it. 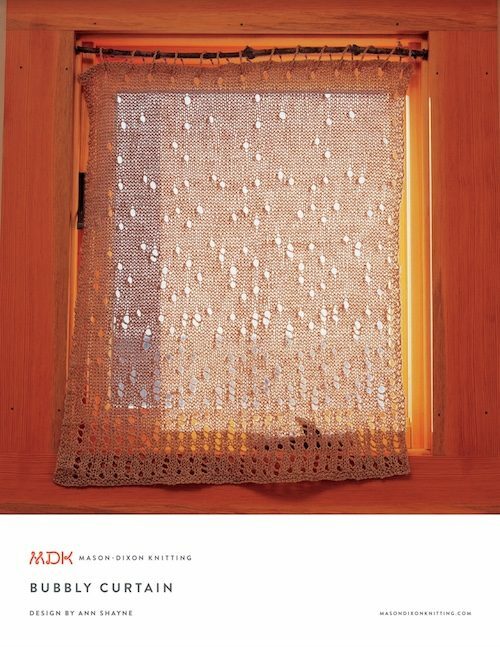 We just added four more patterns to our growing collection of MDK classics. It’s like seeing your toddler suddenly wearing a coat and tie, playing in the jazz band. All growed up! It’s nice to see all these projects now tidied up in a new design, available for the first time in human history as single-pattern downloads. These patterns have been made by so many knitters. Over the years, it has been a great fly-on-the-wall joy to see how everybody makes, adapts, and interprets these ideas. 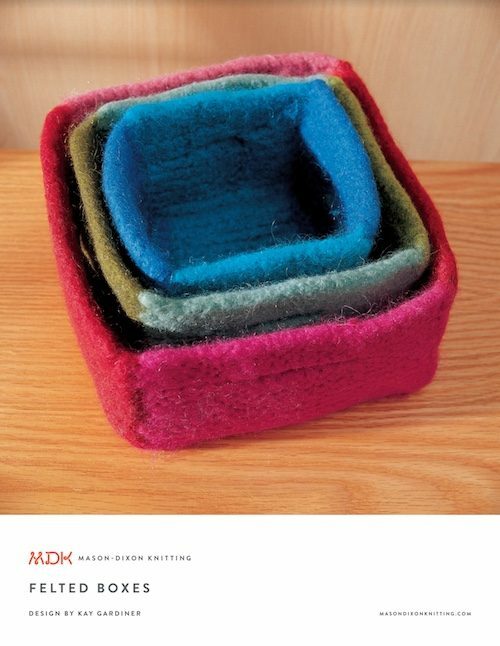 Felted Boxes: 498 projects on Ravelry. I remember your first attempts at these boxes. It took a fair amount of experimentation to end up with boxes that stood up, felted properly, and didn’t flop. I remember how the also-rans ended up cut into felt coasters that are still in use to this day. Heartbreakingly Cute Baby Kimono: 3,143 projects. Cristina Shiffman’s pattern is such origami, and so typical of Cristina’s inventive mind. It kind of made me want to have another baby so I could cook up a pile of these tiny cardigans. Kind of. 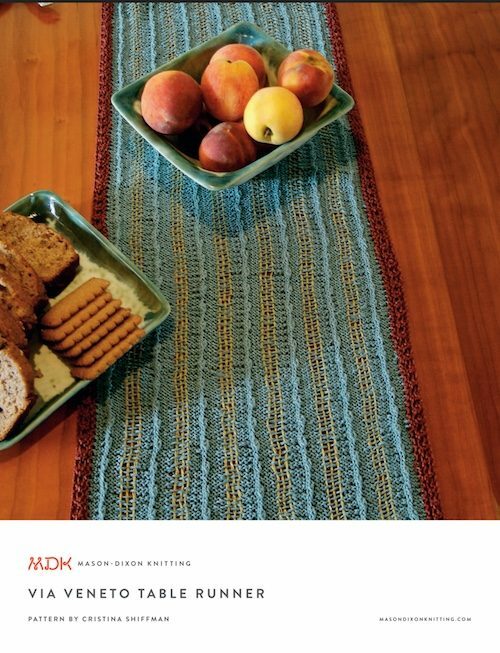 Via Veneto Table Runner: 57 projects. I kept wearing this around the photo shoot as a scarf. I maintain my belief that handknits can serve as table coverings and clothing. Mitered Square Blanket: 964 projects. 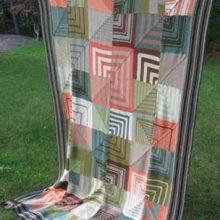 This three-acre blanket seemed like a fantasy project until our friend Judy made a pair of them. And has a third one under way today. This blanket was the first time I realized the mighty addicting power of a square of stockinette. One day only: free shipping on all orders, this Friday, Nov. 25. Discover how fun it is to get a package from MDK! Belinda Wrap: 146 projects. This began as an exploration of working with laceweight mohair and silk, but since then I’ve made this pattern in all sorts of weights of yarn. The effect is different, but it’s beautiful no matter what. 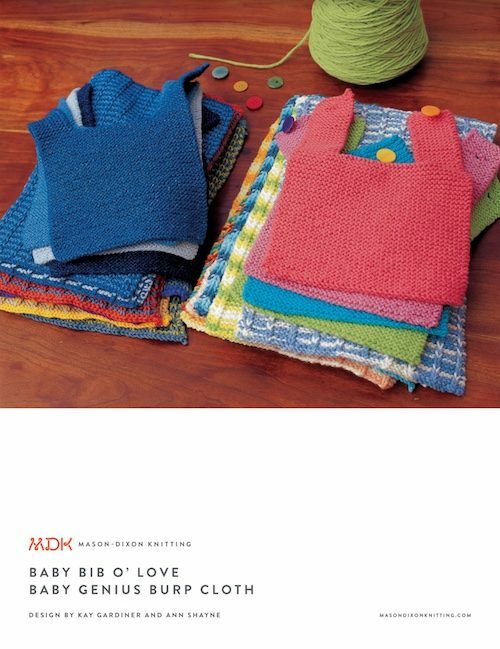 Baby Bib o’ Love and Baby Genius Burp Cloth: 4,100 projects. You can totally win a baby shower with these fast, easy projects. Nonknitters think you are brilliant when you show up with a batch of handknitted baby bibs and burp cloths. Not that a baby shower is a competition. Or anything. 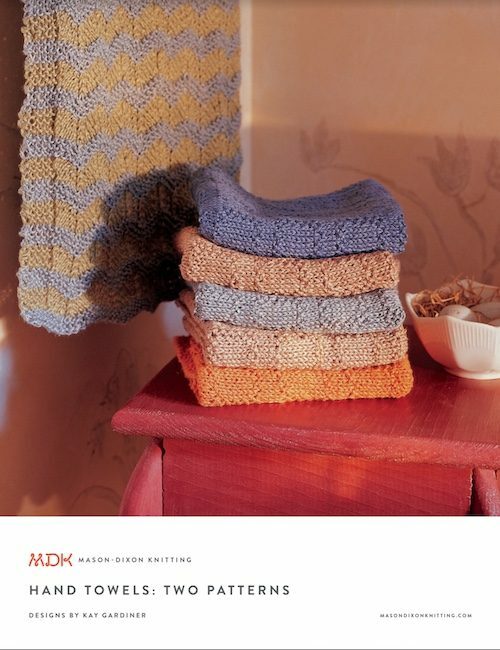 Hand Towels: 215 projects. This came from our phase of Can You Knit It? during which we tried all kinds of stuff. Hand towels made with Euroflax linen yarn: yes. Fishing line? No. Bubbly Curtain: 161 projects. This project lurks in my heart as one that I still haven’t fully explored. I have a kitchen window that really, really needs this curtain. Like an unfinished novel, really. 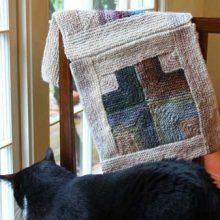 Monteagle Bag: 574 projects. 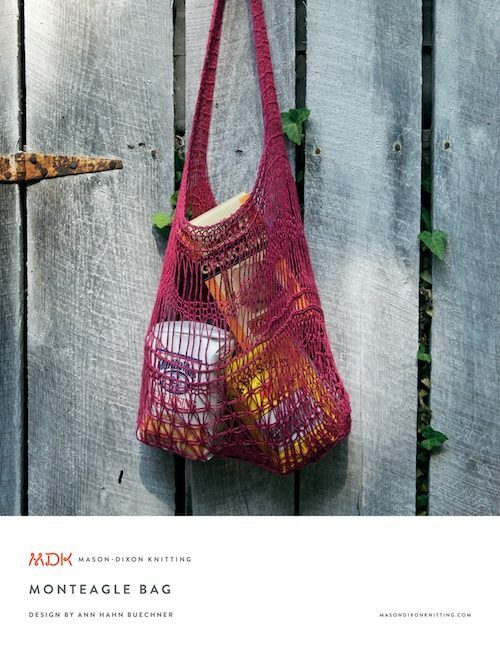 Ann Hahn Buechner’s market bag remains one of my favorite patterns. It doesn’t get any crazier than this: macramé-style knitting. Wishing all a cheerful week. 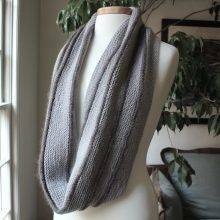 I think I’m going to knit my Giftalong Breton Cowl without cease. While slurping gravy. I made a bunch of Baby Genius Burp Cloths when I was pregnant with my daughter. We ended up not using them so much for burp cloths, but she uses them regularly as washcloths now! OMG, I’m a miterhead! I’m finally in a group of crazy people who adore one thing above all. There is always a single mitered square on a short size-6 round needle, in progress, in a Ziplock bag, in my knitting basket. When I finish one blanket, the next one has already been started because there are orphaned squares, that didn’t make the cut, in the bag. 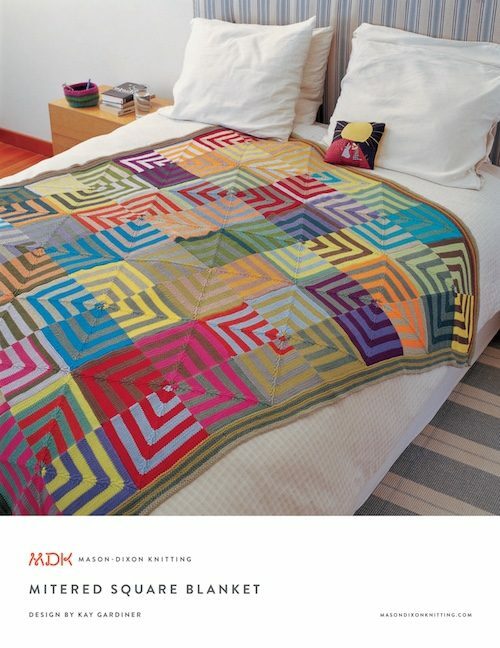 If you make this blanket, be sure to follow Kay’s directions to knit blocks of four mitered squares together. It will make sewing the blanket at the end so much easier. Choosing the happy/sad color combinations (for contrast) for each square became a metaphor for the good times and bad this magnificent and fun knitting project got me through. I never tired of the colorful blocks. These blankets bring me joy whenever I see or use them. This blanket is on my bucket list! I love your happy/sad color theory trick. I also love the idea of having a square at the ready. That way I’m only knitting squares, not a whole blanket. Psychological trick! Eggzactly! Kay was the one who got me on to the happy/sad color choice idea. I just finished a small one for my first grandchild. It makes me melt every time I see him wrapped in it. You will love making it!! I’m not saying I’m getting old but I forgot I knit that adorable baby kimono!!!! I lovingly browse my two MDK books and laugh as I read EVERY TIME. How about those MDK CDs? They took me along some lonely driving hours. The bibs have made many ooh and ah at baby showers , yes, not as if it is a competition. Thank you for the recap, loved it. I have a quick question. 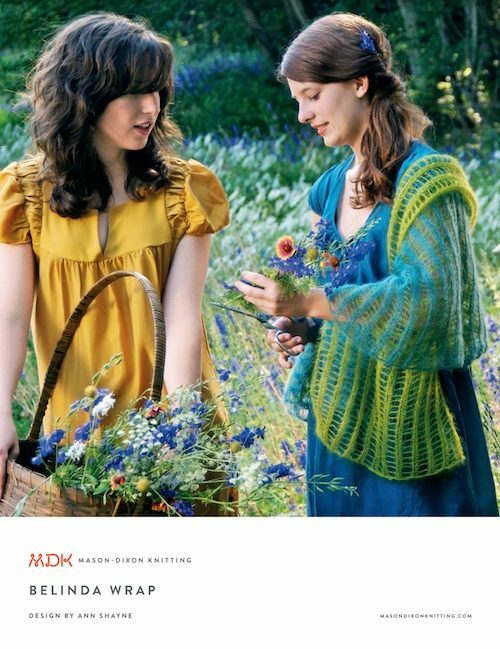 Can the pdf patterns purchased from the MDK web site be stored on Ravelry? It is so much easier to find patterns when I start looking if they are mostly in one place. Hi Ruth! Thanks for asking. 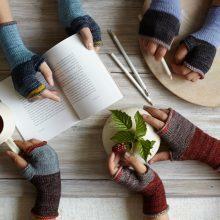 Our patterns are available in two places: 1) right here on our site, and 2) on Ravelry. So if you’d like to store your MDK patterns on Ravelry, option 2 is for you. This is such a good idea 🙂 I really like having a paper copy when working from a pattern. Sidenote: I KNOW I bought the book that includes the Belinda Wrap, but when I wanted to cast on recently, the book was nowhere to be found. I had to request it from interlibrary loan, and it will be a funny – if subtle – joke if it is my original copy. Anyway. It was such a sweet experience to flip those glossy pages and remember events that were going on when I last saw those same patterns. And Jill the Monkey – oh my gosh! (I still have my cast iron salmon, but her dress is just a memory.) But the one thing that made me laugh out loud was the Ann and Kay color wheels. SO funny. And if you take one wedge from Kay’s and squeeze it into Ann’s, well, that’s a very familiar palette. Very. A trip down memory lane this morning!! Thanks! Baby genius burp cloths were gifted to several babies a number of years ago. Especially loved the “genius” statement that I always included with the gift. It always got laughs! I accidentally felted a sweater I knit so I am pretty sure I can do those cute boxes! Clearly you have the necessary skill level for this project! Di, I think of that as Gateway Felting. The mitered squares were the big discussion topic the first time I visited the Mason Dixon Blog, before the first book came out. I immediately cast on and made a mitered square scarf, and then pulled out my polymer clay and made matching mitered square buttons and jewelry, etc. I also knitted up a proper blanket for my nephew a few Christmases ago and am currently working on a denim yarn mitered square lap blanket as a wedding gift for a cousin. I love mitered squares! I’ve also knitted at least a dozen of the Mount Eagle bags! Francie, my polymer miter baubles are still sparking joy! What a nice walk down Memory Lane! 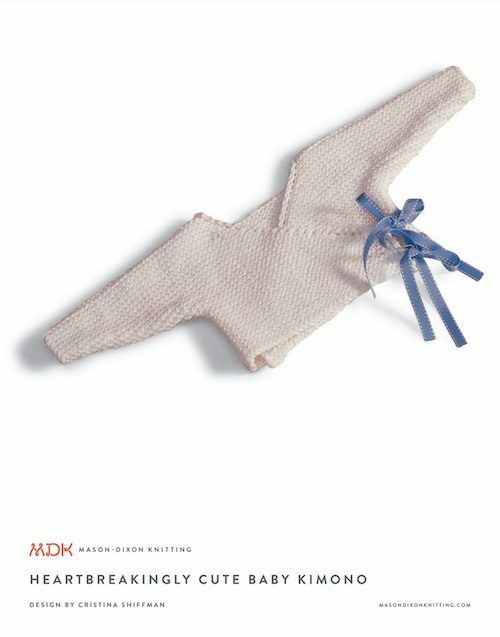 My now 93-year-old mother taught me to knit 10 years ago while she was visiting for the holidays…I found the MDK website, bought your hilarious first book, and tried to knit almost everything in there, starting with ball band dishcloths. As a beginner, each project seemed to take me FOREVER, but I persevered and eventually braved the mitered square blanket for my daughter, who was graduating from high school. I had no idea what I was doing most of the time, but Kay’s tutorials & some instructional YouTube videos helped me figure stuff out, like picking up stitches & attaching an i-cord edge. It literally took me a year to finish that blanket, but it went with my daughter for her first day in the dorm and it is one of my proudest knitting achievements! I’ve put the needles aside lately to pursue calligraphy (& plan said daughter’s wedding), but this post makes me want to go home & knit something! That is a lovely and inspiring story! I’ve knit about six of those delightful, adorable baby kimonos. It’s the first pattern I think of when someone announces an impending wee one! I love that someone labeled themselves a miterhead. That would be me, too. I have done so many of these. I have added checkerboard squares and polka dots, but my favorite is the mitered square with black and white stripes that pop right out of the blanket. The family is still fighting over that one. I’ve been kind of addicted both to the ball band dishcloth and to your blankets. Right now I’ve got both a ball band dishcloth and a Joseph’s Blanky. I would call it a little blanky as in the name, but it’s rather large at this point.